As I write this entry, it is 52F degrees outside. Rain is falling and a winter thunderstorm grumbles and flashes out the window. Our winter has been more springlike than winter. We have had almost no snow and very little cold. Mud abounds making things difficult in the fields or forest. I continue to work on cutting and stacking wood for the sugarhouse woodshed. It is mostly full. Just a few large pieces remain to be split. I have even started on next year’s wood, thanks to a good friend. The ash tree chunks in the foreground, were from dead trees near a lady’s barn. Now, they are no danger and will be utilized to make maple syrup. Those ash trees were near a driveway, so we could cut and clean up without being knee deep in mud. I took the above photo last Sunday. The ground is almost drying out, but today, the rains are soaking it all again. We don’t have to shovel rain and I guess its moisture no matter how you look at it! Cold snap coming for the week’s end. Maybe the ground will freeze and work can continue. In the meantime, I will stay plenty busy…as is a farmer’s life! The sugarhouse woodshed is finally full to overflowing. What a great problem to have. The woodshed is quite large. It measures sixteen by twenty feet. The eave height is just over seven feet. We pile the wood up even higher in the middle, as we stack between the rafters. This wood will be used to boil our maple sap next spring as we make maple syrup. Saturday, my buddy and his five sons, my hired man, my grandson and myself spent just over half a day filling this woodshed. My logsplitter performed great! We had to put a new motor on it a couple months ago. We chose a 22 horsepower Honda. The splitter doesn’t even slow down as large pieces are turned into smaller ones. It is fun to watch. We had a great day. We worked, we laughed and we even fished for a few hours. The day ended with us all laughing, telling stories and eating an ice cream cake from the Dairy Queen. The work was hard, but made easier by all the hands that helped. The young men made me feel old. I used to be the one lifting large pieces and throwing them around defying gravity, but Saturday, I watched as men forty years younger than myself met the challenge. How can it be? My mind still thinks that I can do everything that I used to do, but my body protests, especially the next day! Where have the years gone? Oh well, I still get all the work done….it just takes me longer as I work smarter, not harder. Of course what works even better is having great friends and young men who look up to me. The sugarhouse woodshed is full. I am full … of gratitude for my friends and family. Thank you. No I haven’t been drinking, I just love the smell and feel of line dried sheets. I think it is one of the best sleep aids in the universe. 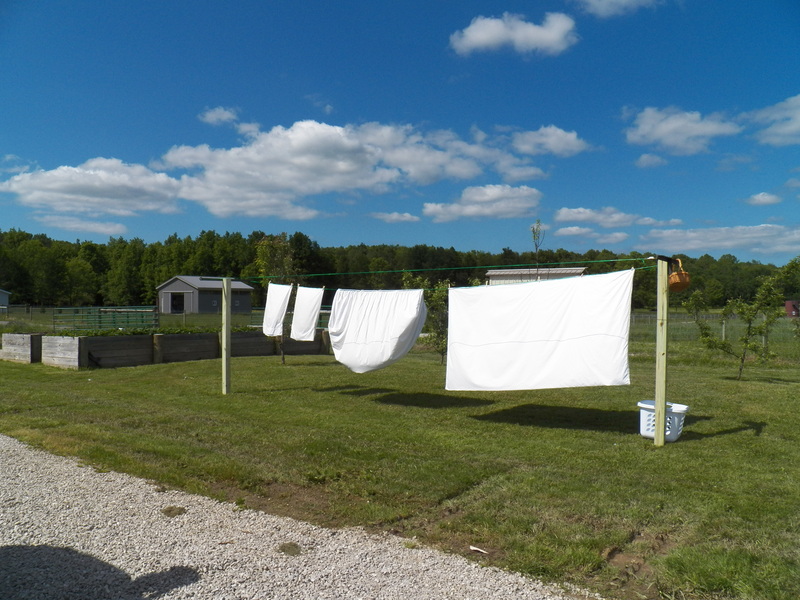 I put this new clothesline up for my wife. She is excited to be able to hang my bib overalls on the line. The buckles, snaps and big zippers beat the heck out of her dryer 😮 I guess with this one, we both win! I have been working extra shifts and trying to keep up with the spring work on a small farm. This makes for a tired farmer and not much time left for writing. The gardens have been planted and many jobs completed. The kindling rack in the woodshed has been filled and the last of the plowing is finished. The speltz looks good. Plump seed heads have formed above the plant and are ripening nicely. 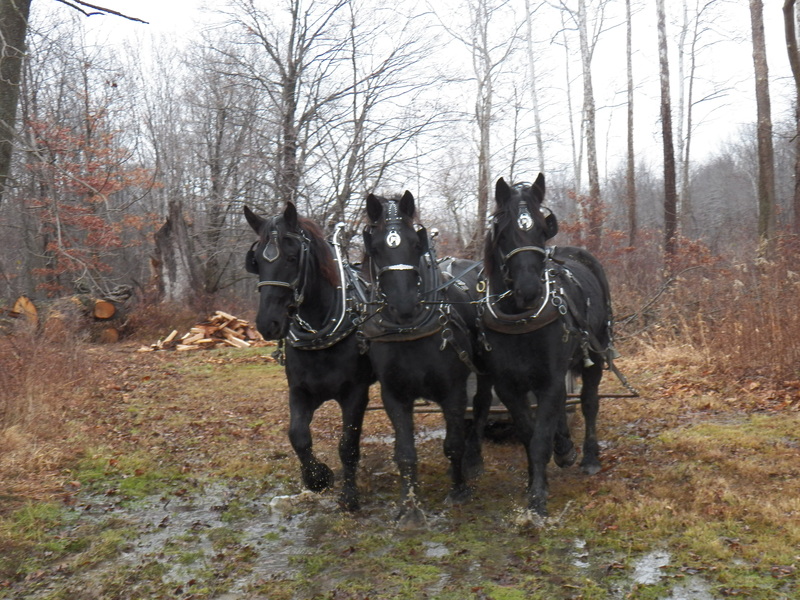 The horses are ready to skid a few more logs to the sugarhouse woodshed to be cut and split. All I need is a little time to make it happen. The hay tools will soon be gathered and made ready to go. The hay is ready to cut. We just need the dry sunny days of summer to cure and dry it. All these things will come. Seventy-one years ago today, many young hit the beaches and countryside of western Europe. Many fine young men didn’t come home. Many were wounded, but they fought on against an evil that gripped a continent, indeed the world. I stand in awe of these men and I thank them from the bottom of my heart. Thanks to all veterans. Thanks to all men and women in uniform today who watch over us while we sleep and protect us from our enemies foreign and domestic. Raise a glass today, but don’t get three sheets to the wind! Yesterday, we spent the entire day hauling the cut and split wood to the sugarhouse woodshed. We needed to make room to be able to split more. We hauled four sled loads, then switched to the wagon and hauled two very large loads with it. The woodshed is filling up. A friend of mine who heats his house with an outdoor wood burner, has been working with me. We are working on the “share” plan. I fill his trailer once or twice a day along with the loads to the woodshed. There is plenty of wood and it is good to have the help. I am sure that I will have the sugarhouse woodshed full before the next round of bad weather comes. My buddy will have more wood stored away than anytime since he started burning wood. I want to keep right on going, making wood for next year. It will be a very good thing to be ahead of the game! As I gather the lines, after the sled or wagon is loaded, and head for the woodshed, I am filled with a sort of peace. It feels as good as going home. The abundance of wood, stored under a dry roof reminds me of mom’s Christmas cookies. Maybe it is the anticipation of the maple syrup season, maybe its the dry wood shed, or perhaps it is just the feeling that all is well? I can’t describe it, but my heart is full, my mind satisfied. I remember getting off the school bus and walking in the backdoor of my childhood home. It was mid December, snow was on the ground and Christmas decorations were about. On our old chest freezer, on top of a holiday table cloth, were rows and rows of Christmas cookies. The frosted ones were my favorite, but the other kinds were eaten with joy too. Perhaps the rows of wood in the sugarhouse woodshed, remind me of the rows of cookies. I only know that it is mid December, snowflakes are falling and I am as happy as a child. My memories of mom are on my mind and like a full woodshed…that is all good!